Canyon ASB: Attention 8th graders that are going to Canyon next year, who are interested in applying for ASB. Mr. Herincx will be hosting an informational meeting about the application process on tomorrow, AFTER SCHOOL in the MPR. Please be sure to attend if you’re interested in being in ASB at Canyon next year. Painting and Phone Photography Class: Mrs. Flaherty is hosting a FREE painting and phone photography class after school from 2:15-3:30 p.m. on March 22 in room 614. You will be able to choose between painting on canvas or creating a phone photo collage on black cardstock. If you’re interested in signing up or finding out more details, please see Mrs. Knolls in the counseling office for a ticket asap since there are only 35 spots available! Canyon Band: On tomorrow at 2:30pm, ALL 8th graders interested in BAND at Canyon High School should plan on joining the CHS Band director, Mr. Hufford in room 401 at SV for a very important band meeting. Birthday Cookies:Come out to the quad on March 25 , if your birthday is in March to get a cookie, remember to bring your ID card. 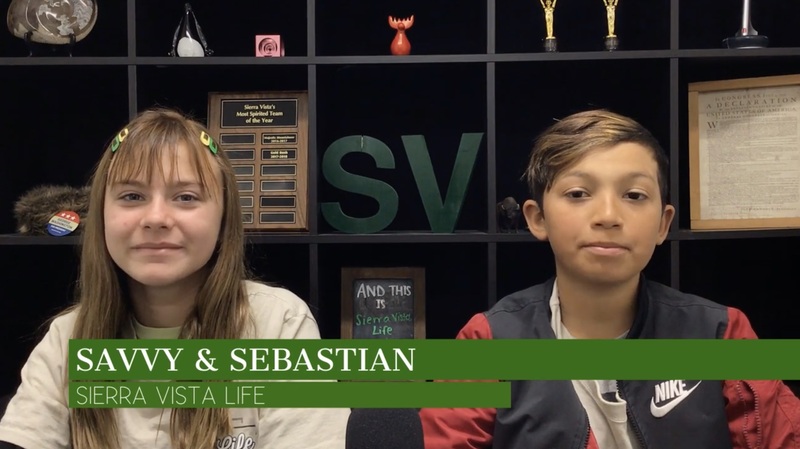 Year-long Electives: If you’re a 7th grader, and you’re interested in applying for ASB, SVlife or Yearbook as your yearlong elective for 8th grade, please note that the informational meeting has been moved BACK to tomorrow, during LUNCH in the MPR, in which you can learn more about each of the elective classes, and get a start on the application process. This meeting is extremely important, and helps to answer a lot of questions. If you cannot make the meeting, please see Mrs. Terranova in room 621 ahead of time. Lost & Found: If you have misplaced a water bottle, jacket, lunch box, or any other personal items come out to the quad on tomorrow at Lunch for the Lost and Found. Items that aren’t claimed will be donated to charity, so be sure to stop by! Talent Show: Our 2019 Talent Show is this today, from 6-7pm. Sierra Vista students get in free with their ID card; no need to get a ticket beforehand. Come and see Sierra Vista’s talented performers and support some of your fellow plainsmen! Dungeons & Dragons: Heroes are needed!! The Teen Librarian from the Canyon Country Public Library is visiting our SV Library for a demonstration of the popular tabletop game Dungeons & Dragons. This will be on tomorrow during lunch. The first 25 attendees will get a Free 20-sided die to take home with them! Free Snacks will also be provided. No ticket necessary. This is open for all grades. Join us for some heroic battles! Band: Advanced Band has rehearsal from 2:30 to 3:30 today. Advanced band has MEET Mr. Hufford after school tomorrow followed by sectionals with Canyon High Mentors 2:15- 3:30. Advanced Band has a Showcase Concert with Canyon High school on 3/22 at Canyon High School. Concert from 7- 9pm. Students meet at Canyon @ 5. Friend Shout outs: Come to the Outdoor Stage on Friday 3/22 at brunch to give a friend a shout out! Spirit Day: This Friday is SPIRIT DAY! Wear tie dye and come out to the quad to spin the spirit wheel and get an otter pop. Fun Friday: Come to the quad on Friday, March 22nd for Fun Friday. We will have an Oreo contest in which you place the Oreo on your forehead and try to bring it down to your mouth. We will also have hula hoops, jenga, and other games. Yearbooks: Yearbooks are currently sold at the ASB window for the presale price of $55 until spring break. After that, the price will go up, so don’t wait! Naviance Learning Style Inventory: A reminder for students who need to complete their Learning Style Inventory in Naviance: If Ms. Roth gave you a blue sheet, please make sure to return it to Ms. Roth by Friday 3/22. Today In Clubs and Activities: We have the dungeons and dragons club in room 1201, tutor club in 620, a DFY in SCV meeting in 305 after school, and the talent at 6-7 pm.